If you're looking for a swanky cruise ship, this isn't it. This Hurtigruten vessel, the MS Midnatsol, is a hybrid, providing cargo and ferry service along Norway's west coast as well as catering to tourists. And while we may be referred to as cruise passengers, we are a unique breed. If you want to fit in, there are a few simple guidelines. Leave behind your formal dress. There is no need to change for dinner, jeans are de rigueur. Don't fret over trendy footwear. Boots reign here. Well dressed means sporting a serious winter jacket. Fashion accessories imply a stocking cap and heavy mitts. 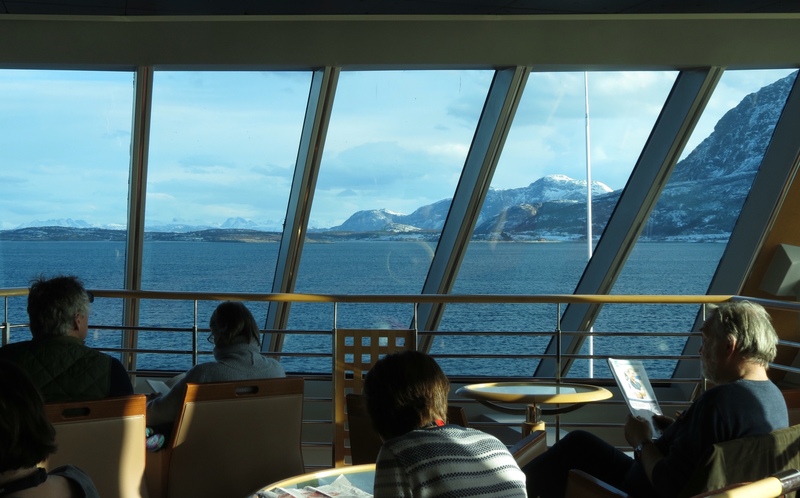 Comfort and warmth are most important when traveling the coast of Norway in mid-winter. We are a supremely practical group of travelers. There is a high population of fine cameras, elongated lenses and binoculars among these folks. The up-close views of the fjords, the mountains and the rugged beauty draw us out on deck at all times of day. We are here to see it, photograph it and marvel in its wonder. No matter that the wind is fierce, the temperature chilly and the sun scarce. We will still be out there. This sailing caters to those eager to see the Northern Lights. Living with an Aurora Hunter, I already know this is not for the faint of heart. Late night hours, false alarms, waiting out in the cold and enduring all weather conditions are par for the course. 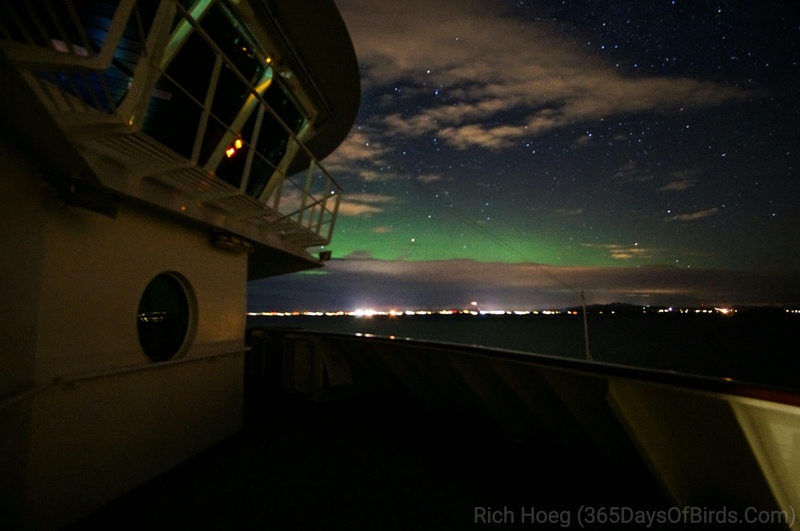 Our first night on the ship, Rich detected a minor aurora merely by looking out our cabin window. Soon we were out on deck, swaddled in down and battling the wind at the prow of the ship at 2:30am. We were alone in that pursuit, but had the display been more dramatic, we would have had plenty of company. What this ship lacks, we don't miss. We cheer the absence of a casino. Evening shows are non-existent. On this voyage, the scenery is the entertainment. We certainly have no need for a swimming pool, although there are two hot tubs outside on the top deck (and I noted its occupants wearing knit hats). The small size of the ship means we begin to recognize many people on board, and quickly strike up friendships. Touring its nine decks, we are soon familiar with the important amenities on board. Deck six has a promenade all the way around, nine features a large outdoor space. Both are handy for viewing and photography. 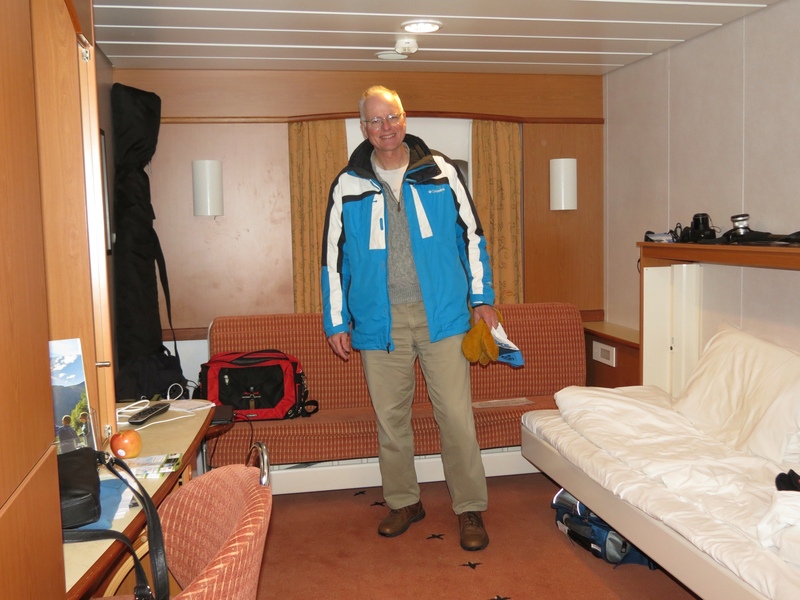 Our stateroom is probably half the size of that on our previous “real” cruise. But we still have plenty of space and storage. And although twin bunks are not our idea of cozy sleeping arrangements, we can manage for four nights. I think everyone likes to complain about food, but I find our meals very palatable. Breakfast is predictably Norwegian. An abundance of cold meats and cheeses with hearty breads and not a sweet in sight is typical. Plenty of cooked options abound, keeping Rich happy, and the muesli with dried fruits and nuts is ample fuel to see me through the day. Despite our casual apparel, dinner is served in a formal manner with assigned tables and two seatings. Thank heavens we are given the first at 6:30. Our three courses have been preselected for us, and are identical to all the other dinners in the room. But the appetizer, main and dessert have yet to disappoint and feature local foods. Few cruise ships can make that claim, and I appreciate the regional flavor. For the armchair tourist or simply for some downtime, there are ample lounges to accommodate indoor viewing. A favorite is the large two-level space at the front of the ship. With enormous forward and side facing windows, the passing scenery is available in all directions. Just for the record, there is a bargain to be found on board ship. At just $5 per day for a 3-day wifi package, we are online in no time. Our past cruise ship charged more than that per minute. Or so it seemed. When it comes right down to it, we fit in here. These are our kind of people, out for the experience not the luxury. 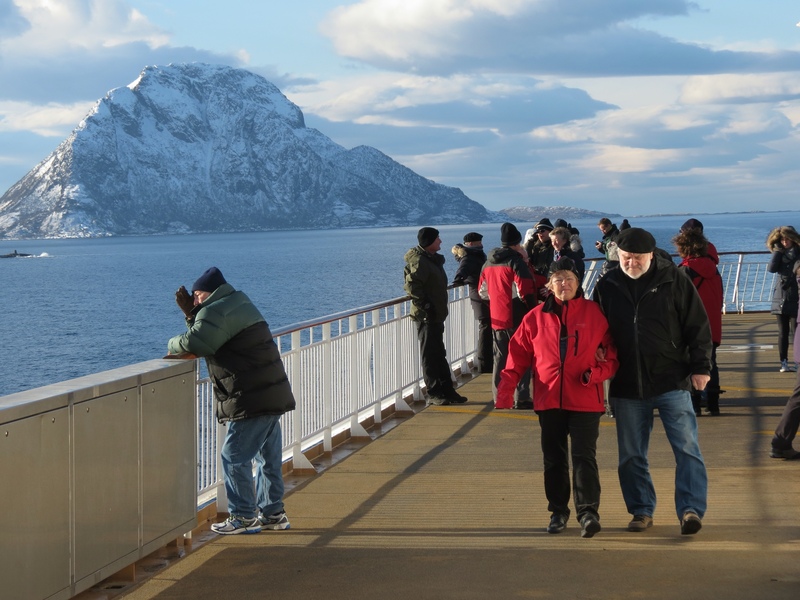 We're loving the Hurtigruten way of cruising. Hi Molly…and Rich too! 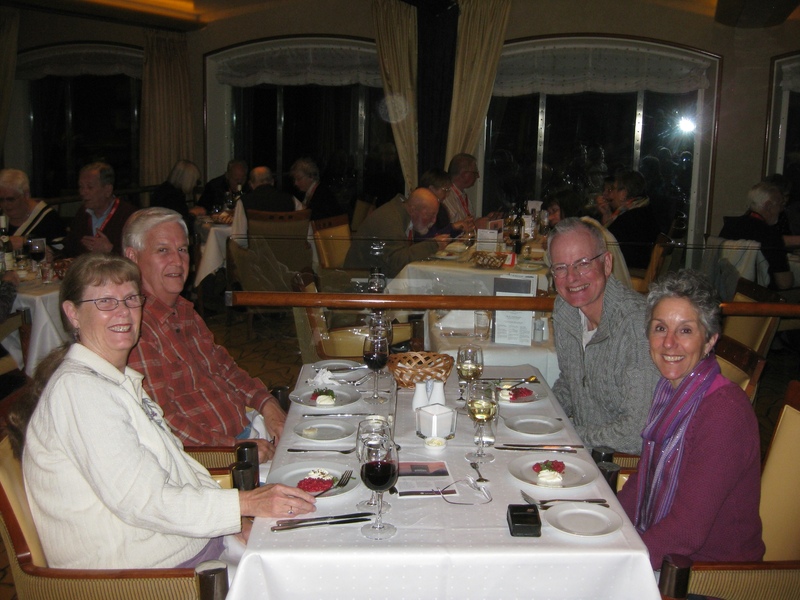 Thanks for the very informative informal review of the ship, cruise, food and ideas on what to take and what to leave behind. Practical information that is really helpful. We are and travel the same way…we don’t need the pool, we hate dressing up. Give us a reasonably priced option and away we go! Its encouraging to know there are reasonably priced options out there. What is weird is I got all of these notifications and updates for your blog in one day! I enjoyed reading each one…but it was weird to get them all at the same time. Can’t wait to hear you final review of the whole cruise and experience once you get home. Would you do it again?